As you know we fostered some Pomeranian puppies earlier this spring, and they went on to be adopted. Then the shelter had litters of kittens being dropped off on a daily basis, and they needed help. So we took a litter of four feral kittens that had lost their mother. They were four weeks old - three orange males and one tabby female. Sadly, a day or two after we took them they became very ill. Tests at the vet did not reveal anything. I began calling it kitty ebola, for lack of a diagnosis. I would come back from running an errand and the cage would be in a biohazard level 4 state. Whew! Those poor sick kitties. We were very sad when one of them died. They were on special food and medicines, but it just wasn't settling their little bellies. Another one became very weak, so I rushed them back to the vet. Still no answers, but since it was a Friday, the vet tech took them home for the weekend. The weakest one had a feeding tube stapled to his head so that he could have constant nourishment. 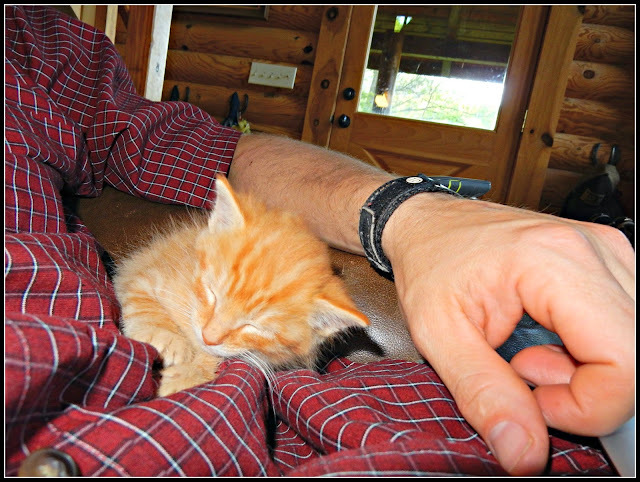 We missed the kittens that weekend - they had already lost their feralness and had become affectionate and purry. The constant feeding from the feeding tube worked, and the little guy rallied. The next Monday, the three of them were able to come back. I got to name them, so I named them after key influences in psychology: Anna, Sigmund, and Hans. They still have some stomach issues, but they are doing much better. I love seeing how playful they are. Hopefully they will continue to thrive and find loving homes in a few weeks! Linked today with Feline Friday. Glad to hear they came around. Oh bless you all for being furry rescuers! I do love marmalade cats, even though I'm horrifically allergic to kitties. Fingers crossed that they continue to rally, and find loving forever homes! What a great thing to help these little kittens. We have a lot of feral cats in our neighborhood, and one of them had a litter of kittens in our boat. Very wild though. Can't get any where near them without a lot of hissing and spitting. I am thankful for people like you that truly care about animals. Hope they grow and thrive now. Yes as Linda said, thank you and everyone who invests so much time, love and resources to give animals another chance. heerlijk alleen al om naar te kijken. Such big hearts you all have! we all hope that they all continue to get better and will be placed in loving homes! Thank you for caring for them. Thank you so much for fostering!! The orange kitty in the photo is adorable, and I know how you love the orange kitties. :-) Do you think you'll adopt any (or all!) of them yourself? Ah poor kitties. I wonder what was wrong with them. Thanks for fostering them. What a great start you are giving them in life. I hope that they all find nice homes. I'm glad they're doing better. Nothing cuter than kittens! I love that you and your family are taking such good care of them!!!! Aww. poor babies! I'm glad the vet tech looked after them. You are a great example to your children. Such cuties. I love their names. Oh I bet you enjoyed the orange kitties. It would be so hard to loose any of them. My heart always goes out to feral cats. Such a rough life. Bless you! You are a true animal lover. I hope the kittens find forever homes. I am glad they are doing better!